The True Indulgence vacation package offers the perfect opportunity to explore a unique combination of history, culture and nature. Visit Lisbon, the lively capital of Portugal offering everything you would expect from a modern European capital. Its long history is everywhere you look, from its Moorish castle to its ancient ruins. Continue with the beautiful Douro Valley - the authentic wine region around the Douro River and conclude your True Indulgence experience in Algarve, the ultimate beach destination with impressive long sandy beaches. From castles and museums to wineries, and from historic and idyllic villages to luxury resorts, on a True Indulgence holiday you will be pampered every step of the way. Welcome to Lisbon, Portugal’s enchanting capital. 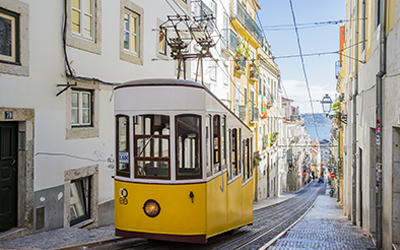 Get settled in at your carefully selected luxury hotel and prepare to be dazzled by Lisbon’s alluring mix of charming locales and contemporary vibe. Head out to explore the city and discover sights like Castelo de Sao Jorge, the Moorish castle that overlooks the city’s historic center and Tagus River. Wrapped around the castle’s slopes you’ll find the Alfama, Lisbon’s oldest and most atmospheric neighborhood – walk around its winding alleys an take in traditional Portuguese street life. Stop in at the Calouste Gulbenkian Museum, a fascinating museum that holds an amazingly diverse collection of artifacts. During your stay in Lisbon be sure to visit Belem, a district with significant maritime history and home to the Belem Tower, as well as the sublime Jeronimos Monastery built to celebrate the achievements of the great Portuguese explorers. Lisbon is a fascinating European capital waiting to be explored! The Douro Valley is one of the most authentic destinations in Portugal; it is a beautiful region located along and around the Douro River in northern Portugal. Check in to your authentic boutique hotel and head out to uncover the hidden treasures of this stunning area. Famous for its wine production, the Douro Valley is listed as a UNESCO World Heritage Site as being the oldest established wine region in the world. During your private local guided tour of the rolling vineyards, you’ll have the opportunity to learn about the region’s history, meet friendly locals, and admire impressive landscapes. Your experience will include a lovely wine tasting and delicious meal at a traditional winery. 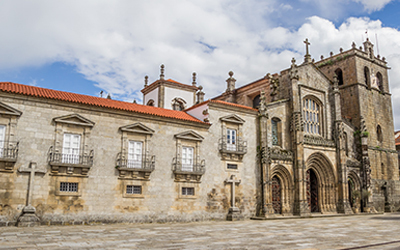 The Douro Valley is more than just a wine region, it offers numerous charming towns including Lamego, Mirandela and Vila Flor – each of which is certainly worth exploring. The Douro Valley is paradise for the senses – a destination that will keep you coming back for more. Welcome to Portugal’s most popular holiday destination! Your True Trips travel expert has planned your stay at a luxurious beach resort so your Algarve vacation will be restful and most rejuvenating. 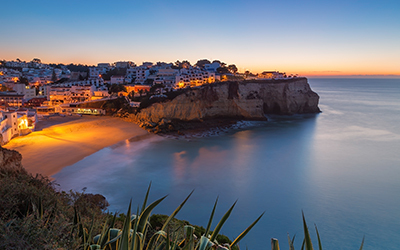 Algarve covers a coastal strip of about 155kms and is dotted with stunning beaches and impressive resorts. Apart from its excellent beach life, Algarve also offers numerous other points of interest such as the region’s capital of Faro with its impressive cobblestoned streets, the traditional towns of Tavira and Lagos, and the Ria Formosa National Park. Algarve is also world famous for its golfing facilities and with over three hundred days of sunshine per year, the golf season lasts for several months! 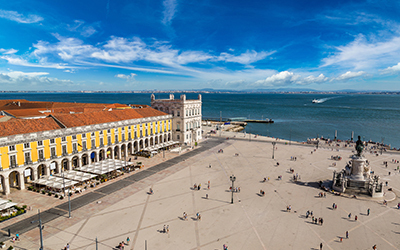 Welcome back to Lisbon for your final stay on your True Elegance Portugal holiday! Having already explored most of the city’s important sights during your previous stay, take some time to relax and get better acquainted with local Portuguese life. Head to the area of Baixa to find some of the most interesting shops and cafes in Lisbon, and then climb up the Avenida da Liberdade until you’ve reached the beautiful Eduardo VII Park. In the evening visit the lively Bairro Alto to find some of Lisbon’s best bars and fado clubs. To conclude your True Indulgence Portugal holiday, your True Trips travel expert has planned a lovely dinner at one of Lisbon’s finest restaurants.